Posted by rogerhollander in Energy, Environment, Science and Technology, Trump. Roger’s note: the massive destruction of our biosphere did not begin with Donald Trump. The essential nature of a capitalist economy demands that the individual need for profit will always override social needs. As world capital runs out of natural resources to appropriate and cheap labor to exploit, it can afford less and less to give in to society’s pressure to preserve the planet. One of the scientists interviewed below has worked for many years in Cuba, a country that I have visited many times and studied for years. Cuba is by no means a genuine socialist state, but because it had its roots in a socialist-like revolution (much like the U.S.S.R.) it has maintained some of the socialist idealism that was the driving force behind its revolution. Perhaps because of universal free education up to and including the post secondary level, there is a degree of culture and sophistication that I consider to be unique to Cuba. The March for Science is a response to the Trump administration’s distaste for science — or at least the kind that gets in the way of profit — but it is also a celebration of those among us who have devoted their lives to understanding how the world works. The thousands descending on the National Mall, on the first Earth Day under a regime that has taken a sharp knife to government science budgets, study stars and butterflies, barrier reefs and hedgehog reproduction, viruses and bird flight patterns. Most days, they make and test their hypotheses in laboratories or perhaps in the Arctic Circle or the Australian Outback, in an anti-gravity chamber or a deciduous forest. But on this warm April Saturday, they have come together in Washington, D.C, to make a point that feels more urgent than ever: Science matters, and we ignore its findings at our peril. Mann is marching because “Science and scientists are now under attack in this country.” He should know. Mann is one of the favorite targets of climate deniers, as evidenced most recently by a hearing of the House Committee on Science, Space and Technology at which he was the only witness representing the mainstream view that climate change is the result of human activity. “We’re starting to realize how seriously our oceans are in trouble,” saidDavid Guggenheim, a marine biologist who studies coral reefs. Since 1970, the Caribbean has lost about 50 percent of its reefs. 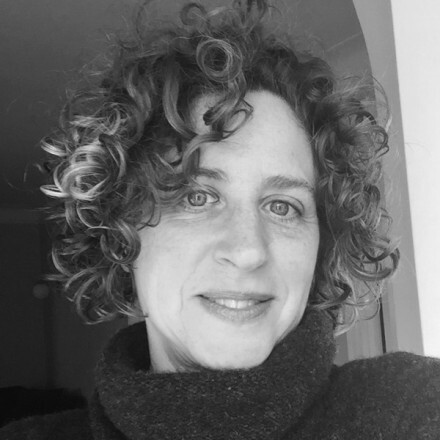 Melanie Killen is a developmental scientist who looks at the emergence of moral concepts from early childhood to adulthood. Theorists used to speculate that morality emerged in adolescence. But Killen and her team showed that a sense of right and wrong begins to form in children who are as young as 3, 4, and 5. By age 5, Killen’s team showed, children can also understand and account for relative advantage. Asked to divide supplies between two schools that have unequal resources, for instance, children will often choose to give a larger share to that the one with less. “They start saying things like, ‘well you have to give them more because then it’ll all be fair,” she said. Jessica Ware is an evolutionary entomologist. Her work focuses on dragonflies, which were the first creatures to fly on earth and are also among the fastest of the animals responding to climate change. Ware has traced the evolution of the insects’ genes through fossils, which date as far back as 250 million years ago, and follows current dragonfly populations in the Yukon and the northern-most points of the world. “Most science gets done for the benefit of the powerful,” said John Vandermeer. “We feel it should be done for the benefit of everyone.” Vandermeer and his wife, Ivette Perfecto, have worked together for 37 years, using ecological principles to improve agriculture. For much of that time, they have focused on coffee production in Puerto Rico. They have also established a coffee plantation in Chiapas, Mexico, where they research interactions among pests and their natural enemies. Agriculture is a major cause of both climate change and species extinctions. But Vandermeer and Perfecto have been studying more sustainable ways of growing, focusing on natural systems that control pests without pesticides. They’ve recently developed games that help farmers understand the complexity of ecosystems. Posted by rogerhollander in Religion, Science and Technology. I believe in magic, the magic of an incredible sunrise, the magic of a tender kiss. I do not believe in the magic of bending spoons with the mind. This is not magic, it is fraudulent pandering to human susceptibility, to mindless superstition. I believe that those who claim to have paranormal powers are not simply entertainers, but rather dangerous frauds. Despite the unbelievable advances in all branches of science and the equally unbelievable expansion of human knowledge, we live in an a “dark” age where unscrupulous agents of enormous economic power and interests take advantage of the credulous instincts of human beings in order to override scientific fact (evolution, climate change) in favor of superstition and “faith.” This often in the service of profit, war and environmental degradation. I have faith. I have faith in those who have shown themselves reliable enough to merit belief. I do not have faith in fairy tales and myths that were created as metaphors but are taken as literal scientific truth by those who enjoy power through manipulation. I have long followed the life and work of Henry Gordon, another Canadian magician (unfortunately not mentioned in this article) who dedicated his life to debunking the paranormal frauds. These men are heroes in my opinion. A few minutes before 8 o’clock one Sunday evening last July, around 600 people crowded into the main conference hall of the South Point casino in Las Vegas. After taking their seats on red-velvet upholstered chairs, they chattered noisily as they awaited the start of the Million Dollar Challenge. When Fei Wang, a 32-year-old Chinese salesman, stepped onto the stage, they fell silent. Wang had a shaved head and steel-framed glasses. He wore a polo shirt, denim shorts and socks. He claimed to have a peculiar talent: from his right hand, he could transmit a mysterious force a distance of three feet, unhindered by wood, metal, plastic or cardboard. The energy, he said, could be felt by others as heat, pressure, magnetism or simply “an indescribable change.” Tonight, if he could demonstrate the existence of his ability under scientific test conditions, he stood to win $1 million. The Challenge began with the solemnity of a murder trial. A young woman in a short black dress stood at the edge of the stage, preparing to mark down the results on a chart mounted on an easel. The first subject, a heavyset blond woman in flip-flops, stepped up and placed her hands in the box. After two minutes, she was followed by a second woman who had a blue streak in her hair and, like the first, looked mildly nonplused by the proceedings. Each failed to detect the mystic force. “Which means, at this point, we are done,” the M.C. announced. With two failures in a row, it was impossible for Wang to succeed. The Million Dollar Challenge was already over. Stepping out from behind the curtain, Wang stood center stage, wearing an expression of numb shock, like a toddler who has just dropped his ice cream in the sand. He was at a loss to explain what had gone wrong; his tests with a paranormal society in Boston had all succeeded. Nothing could convince him that he didn’t possess supernatural powers. “This energy is mysterious,” he told the audience. “It is not God.” He said he would be back in a year, to try again. After Wang left the stage, Randi, who is 86, told me he was glad it was all over. For almost 60 years, he has been offering up a cash reward to anyone who could demonstrate scientific evidence of paranormal activity, and no one had ever received a single penny. The day before the challenge, Randi was wandering the halls of the casino, posing for snapshots and signing autographs. The convention began in 2003 in Fort Lauderdale, with 150 people in attendance, including staff. This year, it attracted more than 1,000 skeptics from as far away as South Africa and Japan. Often male and middle-aged, and frequently wearing ponytails or Tevas or novelty slogan T-shirts (product of evolution; stop making stupid people famous; atheist), they came to genuflect before their idol, drawn by both his legendary feats as an illusionist and his renown as an icon of global skepticism. Ajay Appaden was 25 and had come from the Indian city Cochin. He was attending the conference for the second year with the help of a travel grant from the James Randi Educational Foundation (JREF), which was established with donations from the Internet pioneer Rick Adams and Johnny Carson. In addition to offering grants, JREF holds the $1 million in bonds that back the challenge, and pays Randi’s annual $200,000 salary. Raised as a Catholic, Appaden told me that he discovered Randi in 2010, when he watched the magician in an online TED talk discussing homeopathy. At the time Appaden was a student at a Christian college, struggling with his faith; two years later, during Randi’s first visit to India, he took a 13-hour bus ride across the country to see Randi in person. “It literally changed my life,” he told me, and explained that he now hopes to help teach skepticism in Indian schools. Born Randall James Zwinge in 1928, Randi began performing as a teenager in the 1940s, touring with a carnival and working table to table in the nightclubs of his native Toronto. Billed as The Great Randall: Telepath, he had a mind-reading act, and also specialized in telling the future. In 1949 he made local headlines for a trick in which he appeared to predict the outcome of the World Series a week before it happened, writing the result down, sealing it an envelope and giving it to a lawyer who opened and read it to the press after the series concluded. But no matter how many times he assured his audiences that such stunts were a result of subterfuge and legerdemain, he found there were always believers. They came up to him in the street and asked him for stock tips; when he insisted that he was just a magician, they nodded — but winked and whispered that they knew he was truly psychic. Once he understood the power he had over his audience, and how easily he could exploit their belief in the supernatural to make money, it frightened him: “To have deceived people like that . . . that’s a terrible feeling,” he said. Geller provided Randi with an archenemy in a show-business battle royale pitting science against faith, skepticism against belief. Their vendetta would endure for decades and bring them both international celebrity. 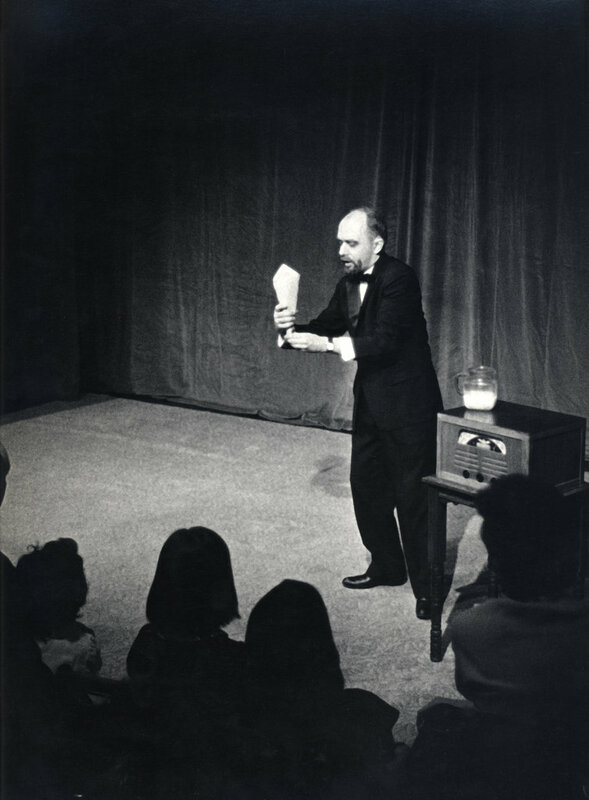 Recognizing that the psychic’s paranormal feats were a result of conjuring tricks — directing attention elsewhere while he bent spoons using brute force, peeking through his fingers during mind-reading stunts — Randi helped Time magazine with an exposé of Geller. Soon afterward, when Geller was invited to appear on “The Tonight Show Starring Johnny Carson,” the producers approached Randi, who had been a frequent guest, to help them ensure that Geller could employ no tricks during his appearance. Randi gave Carson’s prop men advice on how to prepare for the taping, and the result was a legendary immolation, in which Geller offered up flustered excuses to his host as his abilities failed him again and again. “I sat there for 22 minutes, humiliated,” Geller told me, when I spoke to him in September. “I went back to my hotel, devastated. I was about to pack up the next day and go back to Tel Aviv. I thought, That’s it — I’m destroyed.” But to Geller’s astonishment, he was immediately booked on “The Merv Griffin Show.” He was on his way to becoming a paranormal superstar. “That Johnny Carson show made Uri Geller,” Geller said. To an enthusiastically trusting public, his failure only made his gifts seem more real: If he were performing magic tricks, they would surely work every time. 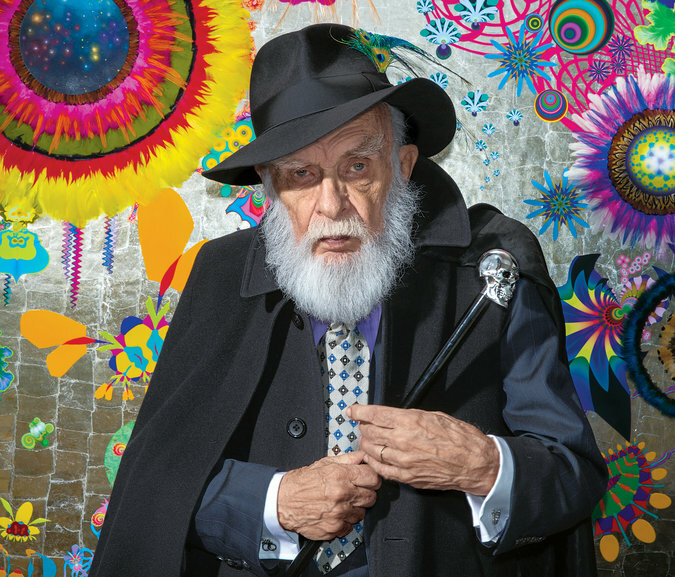 In his new role as a paranormal investigator, in books and on TV shows, Randi debunked everything from fairies to telekinesis. But he also stalked Geller around the chat-show circuit for years, denouncing him as a fraud and duplicating his feats by levering spoons and keys against the furniture while nobody was looking. In 1975, Randi published “The Magic of Uri Geller,” a sarcastic but exhaustive examination of the psychic’s techniques, in which he argued that any scientist investigating the paranormal should seek the advice of a conjurer before conducting serious research. The campaign helped make them both more famous than ever. Even today, Geller credits Randi with helping him become a psychic phenomenon — “My most influential and important publicist,” as Geller described him to me. In 1989, Randi and Geller were booked to appear together on a TV special, “Exploring Psychic Powers, Live!” According to Randi, before the broadcast, Geller pulled him into his dressing room and offered to end the feud. “There’s no way that we are going to make peace until you level with your audiences,” Randi replied. “Until you say that you are a magician like the rest of us, and that you don’t have supernatural powers.” Geller refused. (Geller says he does not recall the incident.) Soon after, Geller brought the first of several libel actions against Csicop and Randi — who, among other things, had characterized him as a sociopath and suggested his psychic feats had been learned from the backs of cereal boxes. Geller’s suits in the United States were eventually dismissed. But the legal costs of fighting the cases were overwhelming, and Randi went through almost all of a MacArthur Foundation grant of $272,000 awarded to him in 1986 for his paranormal investigations. Finally, the struggle with Geller even cost Randi his place in Csicop; when Paul Kurtz told him it had become too expensive to keep going after such a litigious target, and demanded he stop discussing Geller in public, Randi resigned in fury. That fixation on science and the rational life — and a corresponding desire to crusade for the truth — has a long history among magicians. John Nevil Maskelyne, who founded a dynasty of English conjurers in 1855 and became a prolific inventor, began his career by exposing fraudulent spiritualists and reproducing their tricks. Houdini turned to debunking mediums in his middle age as his career as an escapologist went into decline. He offered his own $10,000 reward to any spiritualist who could perform a “miracle” he could not duplicate himself. Martin Gardner, whose book “Fads and Fallacies in the Name of Science” is a founding text of modern skepticism, was also fascinated by magic, and became well known for his books explaining how many conjuring and mind-reading tricks rely upon strict laws of probability and number theory. Penn and Teller have since followed Randi down the path of conjurers who have become debunkers. When I asked him why he believed other people needed religion, Randi was at his most caustic. In the 1980s, Randi turned his talent for deception to debunking the supernatural. He set out to expose New Age channelers, mediums who — on shows and in profitable public appearances — purported to be possessed by ancient spirits. One, JZ Knight, a former cable TV saleswoman, claimed to be the terrestrial mouthpiece of Ramtha, a 35,000-year-old warrior from Atlantis who could predict the future. To show how credulous audiences could be in the face of such claims, in 1987 Randi collaborated with the Australian version of “60 Minutes.” He invented Carlos, a 2,000-year-old entity who, his publicity material stated, had last appeared in the body of a 12-year-old boy in Venezuela in 1900 but had now returned to manifest himself through a young American artist named José Alvarez. He prepared to take Alvarez on a tour of Australia. Alvarez, at the time a 25-year-old student at the Art Institute of Fort Lauderdale, was in fact Randi’s boyfriend, and also his assistant. They met the year before in a Fort Lauderdale public library, where Alvarez was seeking visual references for a ceramics project. Randi, who had only recently relocated to Florida from New Jersey, struck up a conversation with him. They talked all afternoon and moved in together soon afterward. Randi coached Alvarez carefully for his role as Carlos, rehearsing him through mock news conferences and TV appearances. He taught him how to squeeze a Ping-Pong ball in his armpit so that his pulse would appear to slow as he became “possessed” — “an old, old thing from Boy Scout camps,” Randi told me. Before the trip, Randi sent out press kits to Australian TV networks and newspapers, filled with reports charting the apparently sensational — but fictional — progress of Carlos across the United States. Soon after they arrived in February 1988, Alvarez was booked on many of the country’s leading TV shows. Through an earpiece, Randi fed him answers to interview questions and the lines of doomsday prophecies. The climax of his tour was an appearance at the Sydney Opera House, after which the audience was invited to place orders for crystal artifacts, including the Tears of Carlos, priced at $500 each, and an Atlantis Crystal, offered at $14,000. Each proved popular — though Randi’s team never accepted any money for them. When the hoax was revealed a few days later on “60 Minutes,” the Australian media was enraged at having been taken in; Randi countered that none of the journalists had bothered with even the most elementary fact-checking measures. Afterward, Randi and Alvarez returned to Florida together, and Alvarez’s reputation as an artist blossomed. For the next 14 years, he toured the Carlos persona around the world as part of a performance piece, appearing onstage in Padua, Italy, and sitting for photographs on the Great Wall of China re-enacting the hoax. In 2002, the work Alvarez created from the Carlos episode was exhibited at the Whitney Biennial in New York. Meanwhile, the establishment of the James Randi Educational Foundation in 1996 allowed Randi to continue his own pursuits with the foundation’s headquarters, a Spanish-style stucco building in Fort Lauderdale, as his base of operations. He created the Million Dollar Challenge and regularly wrote bulletins for the foundation’s website, where the message boards formed an online hub for skeptics worldwide. In recent years, he began making regular podcasts, and he also created his own YouTube channel to discuss everything from Nostradamus to cold fusion. In 2007, during his TED talk taking aim at quackery and fraud, Randi delighted his audience by gobbling an entire bottle of 32 Calms homeopathic sleeping tablets — which Randi speculated was certainly a fatal dose. Disappointed by what he saw as the media’s indifference to the Million Dollar Challenge, that same year Randi revised the rules and announced a plan to take the challenge to high-profile psychics, including Sylvia Browne, John Edward and — once again — Uri Geller. None of them agreed to participate. He had more success in 2008, when he invited James McCormick, a British businessman, to take the challenge. McCormick had built equipment that could supposedly detect explosives from afar, which Randi recognized was simply a telescoping antenna swiveling on a plastic handle — a dowsing rod. Randi publicly offered the million-dollar prize to McCormick if he could prove that the device worked as claimed. McCormick, who was selling his product to security forces in the Middle East, never responded. But the British Police began an investigation, and last year McCormick was found guilty of fraud and sentenced to 10 years in prison, having sold at least $38 million worth of his miraculous device to the Iraqi government. Recently, age and illness have begun to slow Randi down. In 2009, following chemotherapy for intestinal cancer, he presented the opening address at TAM from a wheelchair. 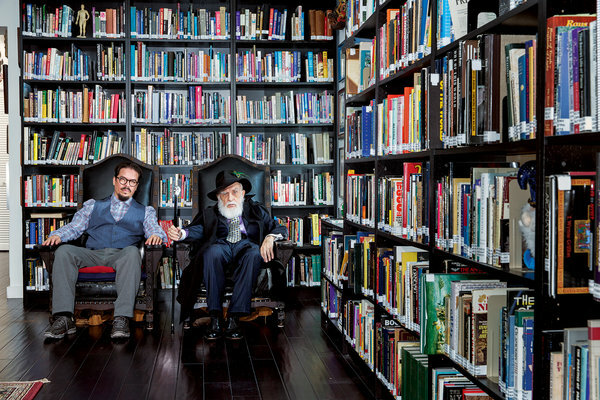 Earlier this year, JREF’s Fort Lauderdale building was sold, and its reference library and collection of memorabilia were boxed up and relocated to Randi’s home. When I visited, many of the cartons remained unpacked; the portrait of Isaac Asimov that once hung above the fireplace in the JREF library was propped against a wall. Randi was all but marooned in the house — he was forbidden to drive while he awaited cataract surgery — and Alvarez had been forced to surrender his driver’s license, after a series of events that began on Sept. 8, 2011. That morning there was a knock on the front door. When Randi opened it, a pair of federal agents stood before him. They asked to speak to Alvarez. Outside, Randi could see two unmarked S.U.V.s blocking the driveway and at least half a dozen agents surrounding the perimeter of the property. When Alvarez came downstairs from his room, the agents explained there was a problem. They wanted to talk to him about passport fraud. They cuffed him and took him out to the car. Randi was left alone in the house, holding business cards from State Department agents, who, Randi said, gave him instructions to wait 24 hours before calling them. The agents took Alvarez directly to Broward County Jail, where he was photographed, issued a gray uniform and registered as FNU LNU: “first name unknown, last name unknown.” In an interview room at the jail, he told an agent everything: He had fled homophobic persecution in Venezuela and had come to the U.S. on a two-year student visa. He met Randi and knew he wanted to stay with him. But when his visa expired, there was no way to renew it. He said he was given the name and Social Security number of José Alvarez by a friend in a Fort Lauderdale nightclub, and used it to apply for a passport in 1987. Alvarez told the agent he was deeply sorry for the trouble he had caused the real Alvarez — who he believed was dead but turned out to be a teacher’s aide living in the Bronx. FNU LNU said his real name was Deyvi Orangel Peña Arteaga. Charged with making a false statement in the application and use of a passport and aggravated identity theft, Peña faced a $250,000 fine, a sentence of up to 10 years in prison and deportation to Venezuela. After six weeks in jail, he was released on a $500,000 bond, and he subsequently agreed to plead guilty to a single charge of passport fraud. At a sentencing hearing in May 2012, the judge considered letters of support from Randi and Peña’s friends from the world of art, science and entertainment, including Richard Dawkins and Penn Jillette, as well as from members of charities to which Peña had given his time and work. The judge considered Peña’s long relationship with Randi, and Randi’s failing health. He gave him a lenient sentence: time served, six months’ house arrest and 150 hours’ community service. But Peña still had to contend with the immigration authorities. After the sentencing hearing, he had been home for five days when Immigration and Customs Enforcement agents appeared at the door. “Say goodbye,” they told him. Peña assured Randi he would be back that afternoon. He was taken to the Krome detention center in Miami, and remained there while his lawyer tried to find a way of keeping him in the United States. After two months of incarceration, Peña was finally released from Krome on the evening of Aug. 2, 2012, to find that Randi had spent half the day waiting outside the front gate for him. The couple were married in a ceremony in Washington the following summer. Today, Peña remains on probation and no longer holds any identity documents except a Venezuelan passport with his birth name. United States immigration authorities have agreed not to deport him for now, but he has no formal immigration status in the United States: were he to leave the country, he would be unable to return. Since his arrest, Peña has not entirely shrugged off his former persona. He signs his paintings with the name he has exhibited under for 20 years — but now followed by his true initials, D.O.P.A. Sometimes when Randi forgets himself, he still refers to his partner as José. Yet exactly how much Randi — the master of deception and misdirection — knew about his partner’s duplicity, and how complicit he may have been in it, is unclear. When Randi first met him in the Fort Lauderdale public library, it seems certain that Peña would have introduced himself by his real name: A profile of Randi published in The Toronto Star the following year describes the magician’s young assistant, named David Peña, struggling through La Guardia Airport with Randi’s luggage. When they traveled to Australia together for the “60 Minutes” stunt, Randi may have been masterminding a deception one level deeper than he ever acknowledged: Deyvi, pretending to be José, masquerading as Carlos, the 2,000-year-old spirit from Caracas. What followed might be the longest-running hoax of The Amazing Randi’s career. When he was still a young man appearing in Toronto nightclubs and pretending to predict the future, Randall Zwinge created what he hoped would be his greatest trick. Each night before he went to bed, he wrote the date on the back of a business card along with the words “I, Randall Zwinge, will die today.” Then he signed it and placed it in his wallet. That way, if he were knocked down in the street or killed by a freak accident, whoever went through his effects would discover the most shocking prophecy he ever made. Zwinge kept at it for years. Each night, he tore up one card and wrote out a new one for the next day. But nothing fatal befell him; in the end, having wasted hundreds of business cards, he gave up in frustration. “I never got lucky,” he told me. Most mornings, Randi is already awake at 7 o’clock, when Peña comes in to check on him; sometimes he’s up at 6. “I’ve got a lot of work to do, still,” he told me, “and I’ve got to make use of my viable time.” He is currently completing his 11th book, “A Magician in the Laboratory,” and spends several hours a day responding to emails from his desk in the chaotic-looking office he maintains upstairs. He Skypes with friends in China or Australia once a week. Peña likes to cook, and paints downstairs, beside the framed lithograph recalling the triumphs of the Man No Jail Can Hold. The couple have spent much of the last year traveling to film festivals and screenings across the United States, helping to promote a new documentary about Randi’s life, “An Honest Liar,” which will be released in February. Randi has been surprised by the response. “Standing ovations, the whole thing,” he told me. In July last year, Randi came closer than ever to the end. He was hospitalized with aneurysms in his legs and needed surgery. Before the procedure began, the surgeon showed Peña scans of Randi’s circulatory system. “Very challenging, a very difficult situation,” the surgeon told him. “But he lived a good life.” The operation was supposed to take two hours, but it stretched to six and a half. When Randi began to come to, heavily dosed with painkillers, he looked about him in confusion. There were nurses speaking in hushed voices. He began hallucinating. He was convinced that he was behind the curtain before a show and that the whispering he could hear was the audience coming in. The theater was full; he had to get onstage. He tried to look at his watch, but he found he didn’t have it on. He began to panic. When the hallucinations became intensely visual, Peña brought a pen and paper to the bedside. It could prove an important exercise in skeptical inquiry to record what Randi saw as he emerged from a state so close to death, one in which so many people sincerely believed they had glimpsed the other side. Randi scribbled away; his observations, Peña thought, might eventually make a great essay. Later, when the opiates and the anaesthetic wore off, Randi looked at the notes he had written. Adam Higginbotham is the author of “A Thousand Pounds of Dynamite,” published by The Atavist. Posted by rogerhollander in Canada, Civil Liberties, Media, Science and Technology. Roger’s note: Canada under the leadership of J. Edgar Harper. Freedom to Read Week begins on Feb. 24, bringing with it the perfect opportunity to kick the tires of democracy and make sure the old jalopy’s still running as she should. What’s that you say? The bumper fell off when you touched it? The engine won’t turn over? That’s not so good. Better look under the hood. We like to think of censorship as something that happens over there, in the faraway places where men break into houses at night to smash computers, or arrive in classrooms to remove books they don’t like. Not in lovely, calm, respectful Canada. Here we don’t necessarily notice freedoms being eroded slowly, grain by grain, “like sands through the hourglass,” if you’ll allow me to quote from Days of Our Lives. Just ask Canada’s government scientists. Oh wait, you can’t ask them, because they’ve got duct tape over their mouths (metaphorical duct tape, but hey – it’s still painful). This week the University of Victoria’s Environmental Law Clinic and Democracy Watch asked federal Information Commissioner Suzanne Legault to investigate claims that scientists are being prohibited from speaking freely with journalists – and through them, the public. You wouldn’t want the average citizen to learn too much about caribou, now. Who knows how crazy he could get with that kind of information? It could lead to panel discussions about Arctic hares, town halls on ptarmigans. The report states that government scientists are “frustrated,” which is hardly surprising. It’s like hiring Sandy Koufax and never letting him pitch. This is not an issue that’s going away. The Harper government’s heavy-handed control of scientists’ research has raised concerns across the world for a few years, including condemnation from such bastions of Marxism as Nature magazine. Last week, Margaret Munro of Postmedia News reported that a University of Delaware scientist was up in arms over a new confidentiality agreement brought in by Canada’s Department of Fisheries and Oceans. “I’m not signing it,” Andreas Muenchow told the reporter. What does this mean for bilateral co-operation on research? Nothing good, that’s for sure. The Vise-Grip on information is tightening and Ottawa is the muscle. Last month, Canadian Journalists for Free Expression released a report about the dire state of freedom of information requests: “Canada’s access to information system is in a deep crisis and without urgent reform could soon become dysfunctional,” the report noted. That means fewer requests being processed, at a more glacial pace, with more of the juicy bits blacked out by the government censor’s pen. This is the good stuff, people. The stuff the government doesn’t want you to know about. The stuff that’s kept in a filing cabinet in Gatineau under a sign that says, “Nothing here. Nope. Just a three-week-old tuna sandwich. And it’s radioactive.” This is the information we need to keep an eye on the government’s internal gears – and it’s being withheld. Canada recently plummeted 10 places to No. 20 in the World Press Freedom Index, which measures how unfettered a country’s media is. Reporters Without Borders, which compiles the index, is concerned about the access-to-information issue and about the protection of journalists’ sources. The beacon we should now follow is Jamaica, whose press freedoms rank highest in the region. It’s the perfect time to welcome Freedom to Read Week. There are events all over Canada and countless ways to celebrate our precious liberties. Bring your kids to the library. Read something you shouldn’t. Even better, write something you shouldn’t. A letter to your MP, perhaps? Posted by rogerhollander in Education, Religion, Right Wing, Science and Technology. Roger’s note: What is at issue here is not only the question of publicly funding the idiotic notion of creationism, but the very substance of public education. Public education (advocated by Karl Marx in the Communist Manifesto) is a sine qua non of democracy. The massive effort by the extreme right to privatize public education, aided and abetted by Obama and his Education Secretary Arne Duncan, is aimed at replacing what is left of democracy in the United States with theocratic tinged militarized corporatism. Part of an exhibit at the Creation Museum in Petersburg, Ky. According to so-called education reform advocates like former Florida Gov. Jeb Bush and his Foundation for Excellence in Education, school vouchers, which allow parents to direct state money to private schools of their choice, are essential because “families need the financial freedom to attend schools that meet their needs.” From Louisiana Gov. Bobby Jindal, a Republican, to Newark, N.J.’s Democratic Mayor Cory Booker, these programs are backed by politicians on both sides of the aisle, and they enjoy the support of powerful interest groups such as the Friedman Foundation for Educational Choice and the American Federation for Children. Voucher programs have been established in 12 states and the District of Columbia, and they are spreading as Texas and Tennessee attempt to create ones of their own. As the use of vouchers has expanded across the country in recent years, new questions have arisen that extend beyond concerns about their appropriateness and legality. We’ve pushed standards, testing and accountability for public schools, so why shouldn’t private institutions receiving vouchers have to meet those same requirements? Should private institutions be allowed to ignore state science standards and teach their students creationism while receiving taxpayer money? Does learning about biblical creation, rather than evolution, really help to meet students’ needs? This isn’t just a Louisiana problem. It seems clear that the U.S. is facing a national creationism epidemic. In an exposé I wrote posted by MSNBC host Melissa Harris-Perry, I identified hundreds of additional voucher schools in nine states and the District of Columbia using dozens of different creationist curriculums. These schools are receiving tens of millions of dollars, and maybe even hundreds of millions, to teach religious beliefs in violation of state science standards. With 164 such campuses, Florida’s John M. McKay Scholarships for Students With Disabilities Program contained the highest concentration of creationist voucher schools I was able to uncover. Indiana, which has been marketed as the “gold standard” for voucher accountability, has at least 37 such schools teaching creationism. A couple of its campuses proudly advertise that their students are taken to the Creation Museum on field trips. So far, I’ve discovered 311 creationist voucher schools across the country. Those 311 schools are not the only taxpayer funded institutions teaching creationism. There are likely hundreds more. Although many are difficult to find, either because they don’t have websites or don’t advertise their creationist curriculum, lots of voucher schools fit the profile of creationist campuses that are already known. On top of this, two states, Arizona and Mississippi, have voucher programs but don’t release the names of participating schools. Officials with the Arizona Department of Education confirmed to me that every private school in the state is eligible to participate in the program, and since I’ve identified private creationist schools there that could be involved, there is little doubt that Arizona is funding some of them. I believe it’s a safe bet that every school voucher program in the country is financing creationism. These campuses would be shut if they were subject to the same standards as public institutions. The courts have shot down the teaching of creationism and intelligent design with public money over and over again, so why are we letting taxpayer funded private voucher schools teach them? The scientists and educators who devised both state science standards and the national common core standards knew creationism was pseudo-science that would not help American students get the education they need to succeed in a global, 21st century economy. That’s why we don’t teach creationism in public schools. Taxpayers should be outraged that their hard-earned dollars are enabling the mis-education of private school students. Aside from not meeting these basic academic standards, many voucher schools suffer from other significant problems. Louisiana bloggers have exposed profiteering prophets who sought to capitalize on taxpayer funding for private schools. The Miami New Times reports that voucher schools in Florida are being run by administrators who “include criminals convicted of cocaine dealing, kidnapping, witness tampering, and burglary.” A school in Louisiana’s program was slated to receive millions of dollars from vouchers but lacked the facilities needed to house new students. Proponents of vouchers argue that diverting money from public to private schools will help students learn by increasing inter-campus competition. But when voucher programs contain institutions that teach creationism instead of science, it’s easy to see that damage is being done to students whose futures are jeopardized by poor education. Although a judge recently ruled that the way Louisiana funds its school voucher program is unconstitutional, it continues to operate as the state appeals the decision. Similarly, the voucher program in Colorado has been halted by a court injunction. But given the aggressive activity of taxpayer funded voucher programs across the country, we need to fight to make sure that no additional ones are created. And we need to stop politicians in states such as Indiana and Wisconsin from following through on plans to expand already existing programs. Today’s students and our nation’s future demand it. Zack Kopplin is a science education advocate and winner of the Hugh M. Hefner First Amendment Award in Education and the National Center for Science Education’s Friend of Darwin Award. ATLANTA- A Georgia congressman who attacked the theory of evolution found himself with an unlikely opponent in Tuesday’s U.S. election, when 4,000 voters in one county cast write-in ballots for the 19th century father of evolution, British naturalist Charles Darwin. Since Broun, a Republican, had no opposition in the general election, a University of Georgia plant biology professor, Jim Leebens-Mack, and others started a write-in campaign for Darwin, the father of the theory of evolution. “We don’t feel our interests are being best served by an anti-science fundamentalist representing us on the Science, Space and Technology Committee,” Leebens-Mack told Reuters on Friday. The write-in votes in Athens-Clarke County will not count officially since Darwin was never certified as a write-in candidate, but Leebens-Mack hopes the campaign will encourage a strong candidate, Democrat or Republican, to challenge Broun in 2014. “I think there could be Democratic opposition, but even more likely is having a rational Republican who understands issues like global warming, scientific reasoning more generally,” said Leebens-Mack. Broun received 16,980 votes in Athens-Clarke County, home of the University of Georgia, Broun’s undergraduate alma mater. Broun’s office issued a statement on Friday that did not directly address Darwin, saying that the congressman “looks forward to representing the … constitutional conservative principles” of his constituents. You might have thought it was all over after the 2005 decision by the US district court of Middle Pennsylvania (pdf), which ruled in the case of the Dover Area schools that teaching intelligent design is unconstitutional. You might have guessed that they wouldn’t come back after the 1987 US supreme court decision in Edwards v Aguillard, which deemed the teaching of creationism in Louisiana schools unconstitutional. 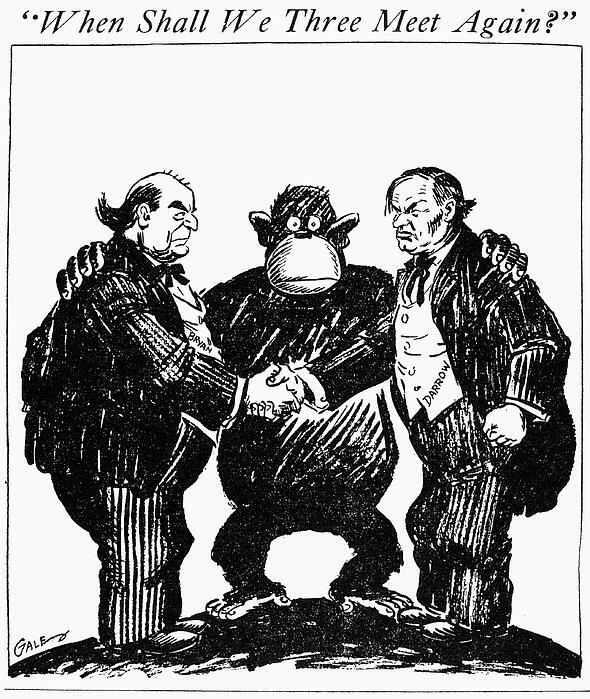 Or maybe you figured that the opponents of evolution had their Waterloo in the 1925 Scopes “monkey” trial in Tennessee. For the most part, the authors of these bills are singing a song we’ve heard before. Jerry Bergevin, the Republican sponsor of one of the New Hampshire bills, says of evolution that “It’s a worldview and it’s godless.” He blames the teaching of evolution for Nazism and Columbine. Josh Brecheen, the sponsor of the Oklahoma bill, wants to stop the teaching of “the religion of evolution.” These legislators, and their colleagues in Missouri and Indiana, trot out the hoary line that evolution is “just a theory” and that real science means saying that every point of view is just as good as any other. Most of these bills aren’t likely to get anywhere. The Indiana bill, which specifically proposes the teaching of “creation science”, so obviously falls foul of the supreme court’s 1987 ruling that it’s hard to imagine it getting out of committee. The same could be said for the Missouri bill, which calls for the “equal treatment” of “biological evolution and biological intelligent design”. Still, it’s worth asking: why is this happening now? Well, in part, it’s just that anti-evolution bills are an indicator of the theological temperature in state houses, and there is no question that the temperature has been rising. New Hampshire, Indiana, Oklahoma, and Missouri turned deeper shades of red in the 2010 elections, as did the US Congress. But there are a couple of new twists that make this same-old story more interesting than usual. One has to do with the temperature in a less metaphorical sense. The Oklahoma bill isn’t properly speaking just an “anti-evolution” bill; it is just as opposed to the “theory” of “global warming”. A bill pending in Tennessee likewise targets “global warming” alongside “biological evolution”. These and other bills aim their rhetoric at “scientific controversies” in plural, and one of the New Hampshire bills does not even bother to specify which controversies it has in mind. The convergence here is, to some degree, cultural. It just so happens that the people who don’t like evolution are often the same ones who don’t want to hear about climate change. It is also the case that the rhetoric of the two struggles is remarkably similar – everything is a “theory”, and we should “teach the controversy”. But we also cannot overlook the fact is that there is a lot more money at stake in the climate science debate than in the evolution wars. Match those resources with the passions aroused by evolution, and we may have a new force to be reckoned with in the classroom. The other significant twist has to do with the fact that the new anti-evolution – make that anti-science – bills are emerging in the context of the most vigorous assault on public education in recent history. In Oklahoma, for example, while Senator Brecheen fights the forces of evolution and materialism, the funding for schools is being cut, educational attainments are falling, and conservative leaders are agitating for school voucher systems, which, in the name of “choice”, would divert money from public schools to private schools – many of them religious. The sponsor of Indiana’s anti-science bill, Dennis Kruse, who happens to be chairman of the Senate education committee, is also fighting the two battles at once. The Heartland Institute – which has received funding in the past from oil companies and is a leading source of climate science skepticism – also lobbies strongly for school vouchers and other forms of “school transformation” that are broadly aimed at undermining the current public school system. The Discovery Institute – a leading voice for intelligent design – has indicated its support of exactly the same “school reform” initiatives. If you can’t shut down the science, the new science-deniers appear to be saying, you should shut down the schools. It would be a shame if they succeeded in replacing the teaching of science with indoctrination. It would be worse if they were to close the public school house doors altogether. In a country which touts itself as being the freeist in the world in respect to practicing religion, a representative has no ground to call another person’s spiritual beliefs “criminal.” Furthermore, if anything in the United States violates human rights, it’s the fact that our prison system is out of control, or that the wars in Iraq and Afghanistan have killed thousands of innocent civilians, or that our President signed legislation making indefinite detention for Americans a real possibility. It’s simply incredible that these elected representatives can turn a blind eye to real human rights violations while inventing others. To boot, both Hooper and Bergevin seem to completely misunderstand what teaching evolution involves. The belief that species evolve and change over time does not necessarily invalidate the idea that God exists. Charles Darwin once said that man “can be an ardent Theist and an evolutionist.” Even the Catholic Church accepts evolution, with the caveat that God played a role. Bergevin’s idea that a belief in evolution makes murderers implies that plenty of his own faithful friends in Christendom should be treated as criminals. While that’s good news, it’s still troubling to even see this debate on the floors of legislative houses in this day and age. If America is to get out of the mess it’s currently in, its legislators need to start tackling present problems, rather than rehash debates settled long ago. Posted by rogerhollander in Religion, Right Wing, Science and Technology, Uncategorized. It’s a pathetic commentary on the anti-intellectualism rampant in American politics that this is newsworthy. A major-party candidate announces that he doesn’t deny a foundational theory of modern science! In fact, given the political atmosphere in the Republican party, it’s not just newsworthy but a daring act: polls have shown that almost 70 percent of Republicans deny evolution. Huntsman is clearly trying to position himself as the moderate candidate. But while that strategy might play well in the general election, it won’t do him any good unless he can get the Republican nomination. And to win that nomination, he has to get past a huge obstacle: a solid bloc of Republican primary voters who are emphatically anti-science. This isn’t an exaggeration for polemical effect; it’s the plain truth. The modern Republican party has made a fervent rejection of scientific consensus its defining attribute — both on evolution and climate change, as well as in other fields — and Huntsman’s refusal to submit to party orthodoxy is likely a fatal blow to his chances. But opposition to climate change is something new in the Republican platform. As recently as a few years ago, both Mitt Romney and John McCain supported cap-and-trade laws, and Newt Gingrich appeared in pro-environment ads with Nancy Pelosi. The party’s rejection of climate science is fairly new, and probably comes from its increasing dependence on campaign cash from dirty-energy barons like the Koch brothers. By contrast, the Republican party’s denial of evolution is much older and more grassroots in nature, dating at least to when the national parties traded places during the civil-rights era. The conservative South, in addition to its other charming qualities, has a long history of passing laws hostile to science, from Tennessee’s Butler Act, the 1925 law prohibiting the teaching of evolution that led to the Scopes trial, to Louisiana’s 1981 Balanced Treatment Act, which decreed that “creation science” had to be given an equal share of classroom time. But while fundamentalists have always been hostile to evolution, the modern creationist movement got its start in the 1960s, primarily due to the influence of an evangelical author named Henry Morris. Morris’ 1964 book The Genesis Flood argued, among other things, that Noah’s flood happened just as the Bible describes it — in other words, it was reasonable to believe that eight people could care for a floating zoo containing at least two members of every species on Earth. Imagine trying to run the entire Bronx Zoo with just eight employees. Now consider that Noah’s leaky tub, by even the most forgiving estimates, would have to have had far more kinds of animals (including dinosaurs, which creationists believe existed simultaneously with humans, a la the Flintstones). Imagine how much feeding, watering, and manure-carrying that would be. Imagine all this frenetic activity taking place in the cramped, dark, foul-smelling confines of a wooden boat, with predators and prey side-by-side in narrow pens, during the most violent and catastrophic storm in the history of the planet, with an absolute requirement that not a single animal get sick or die. Now try not to laugh too hard at the people who seriously believe all this really happened. As already mentioned, the creationist movement’s original strategy revolved around getting friendly state legislatures to decree that their ideas had to be taught in public schools, regardless of scientific merit or lack thereof. This strategy hasn’t fared well in court: aside from a Pyrrhic victory in the Scopes trial, judges have repeatedly recognized this for the obvious violation of separation of church and state that it is. And each time they lost, the creationist movement responded the same way: like a snake shedding its skin, they rebranded themselves with a new name, then tried again with the same ideas. “Creation science” became “scientific creationism,” which became “abrupt-appearance theory,” and so on. The currently preferred nomenclature is “intelligent design” (which is totally constitutional and not at all religious, because we’re not saying who we think the intelligent designer is — nudge nudge, wink wink!). But even this watered-down creationism met with defeat in Dover, Pennsylvania in 2005, when a judge appointed by George W. Bush handed down a resounding ruling that teaching intelligent design in public school is unconstitutional. But while creationists keep bumbling on the legal front, they’ve had more success in the cultural arena, by infiltrating the public schools with creationist teachers who flout the law and preach their religious beliefs in class. There are some notable and egregious examples, such as David Paskiewicz, the New Jersey high school teacher who advocated creationism in class, in addition to telling a Muslim student she belonged in hell. There’s also John Freshwater, a creationist science teacher who was fired for breaking school rules about proselytizing in the classroom. Among other things, he allegedly used a Tesla coil to burn a cross onto a student’s arm! Although there are different kinds of creationists, the most fervent and most influential are the so-called young-earth creationists, who believe the world and every species on it is about 6,000 years old. The young-earth creationists, or YECs for short, believe the universe was created in seven 24-hour days, that there was a literal Garden of Eden, a literal Adam and Eve, and a literal talking snake just as the Book of Genesis describes. Likewise, the geologic record shows that the Earth has an enormously long and intricate history. Preserved in the rock record, we see evidence of continents drifting and colliding, thrusting up mountain ranges that are then slowly worn down by erosion; glaciers advancing and retreating, carving and scouring the landscape; sedimentary rock layers slowly built up by eons of deposition, then cut into deep canyons by rivers or metamorphosed by heat and pressure; the same land becoming shallow sea, swamp, forest, plain, desert and back to sea again, as sea levels rise and fall over the ages. This grand tapestry stands in stark contrast to the creationists’ cartoonish view of geology, in which Noah’s flood was the only geological event of significance to happen in the planet’s brief history. Geologists knew well before Charles Darwin that there was no evidence for a global flood, and modern scientists can add the evidence of radiometric dating, which shows the precise ages of ancient rocks and artifacts and proves that they’re far older than the creationist worldview permits. And then there’s the direct evidence for evolution, in all its sprawling grandeur. We know evolution is true from genetic studies which show that all species share deep similarities at the genetic level. In fact, by charting which species’ genomes share the same one-off mutations, we can build evolutionary trees which show the patterns of relationship between species and allow us to estimate when they branched from each other. This nested hierarchy, the pattern produced by descent with modification, binds all living and extinct species together in an unbreakable web of heredity and kinship, every bit as real as the one that connects you to your ancestors and your living relatives. We know evolution is true from the kludges, hacks, and jury-rigs we find in the anatomy of living things, including us — evidence not of a wise and forward-looking designer, but of a slow, mindless, tinkering process of change, a “blind watchmaker” as Richard Dawkins famously termed it. From the useless goosebumps we get when cold or frightened, to the backward-wired human retina, to the babies occasionally born with vestigial tails, human bodies bear the indelible stamp of our species’ history. The creationists are forced to deny all this and much more besides. That’s not a figure of speech: major creationist organizations and religious colleges require their faculty to sign statements promising to reject any evidence that contradicts their worldview. The official statement of faith of the group Answers in Genesis, for example, requires members to affirm that “No apparent, perceived or claimed evidence in any field, including history and chronology, can be valid if it contradicts the Scriptural record.” And when people affiliated with these groups do express doubt or flirt with unorthodoxy, retribution is invariably swift and harsh. But as laughable as the creationists’ beliefs are, the creationist movement is no joke. They want to wipe out all the findings of hundreds of years of scientific investigation, erase everything we’ve learned about the vast and majestic history of the universe, and replace it with a cartoon version that grotesquely magnifies our own importance, treating human beings as the crowning glory of creation and diminishing the immensity of the universe to a tiny stage crafted only so that the Bible’s small stories could play out on it. The larger lesson to be drawn from this is that the religious right isn’t just targeting the theory of evolution. By their own words, they can’t be. They believe that a person’s morality is completely determined by their factual beliefs — that being a good person depends on believing the right things about the origin of the universe. And since they believe that all truths worth knowing have already been revealed in the Bible, it follows that science is at best unnecessary and at worst a fatal deception that leads people away from salvation. Why, then, do we need science at all? To those who hold the creationist worldview, everything has been going downhill since the Enlightenment. The willingness of people to think for themselves, to question authority, to investigate the world for truth – they see all this as a disastrous trend, one that only takes us farther from their ideal vision of a medieval, theocratic state. They seek nothing less than to turn back the clock of progress by several centuries, abolish the rational, reality-based view of the world, and return to the superstitious mindset in which blind faith is the answer to every problem. And, again, these are the people who’ve completely captured one of America’s two major parties. What kind of havoc will result if they gain political power again? Posted by rogerhollander in Science and Technology. 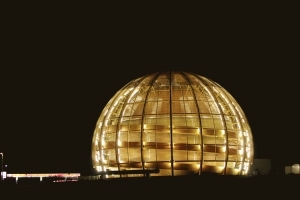 The globe of the European Organization for Nuclear Research, CERN, is illuminated outside Geneva, Switzerland, early morning Tuesday, March 30, 2010. GENEVA, Switzerland — In the antimatter department at CERN, the world’s biggest science facility, a picture hangs on the wall showing the filmmaker Ron Howard surrounded by beaming scientists. Howard’s adaptation of the Dan Brown novel Angels & Demons centers around a secret society that steals a small quantity of antimatter from CERN and hides it in the Vatican. The book and the film’s scientific accuracy was limited to the convenient plot point that, when brought together, antimatter and matter annihilate one another in a terrific burst of energy, just enough, in this case, to wipe out Vatican City. Now to reality: scientists at CERN announced recently that they had managed to create, isolate and hold a small quantity of antimatter for over 16 minutes — the longest by far that had been achieved. So far so frightening? Not exactly. The Vatican can rest easy, explains Joel Fajans, a physicist from the ALPHA project, which made the breakthrough. There are fundamental reasons why an antimatter bomb will never be made. The purpose of creating and holding antimatter, rather, is to study this strange twin of matter in the hope of solving one of the great riddles surrounding the creation of the universe — and thereby explain why we are here at all. Basic laws of physics postulate that matter and antimatter should have been created in equal quantities in the Big Bang and gone on to cancelled each other out, leaving behind only energy. That means no stars, no planets, no people. Instead, for reasons physicists can only guess at, matter gained a slight advantage over antimatter in the fiery moments after the Big Bang. A fraction of a percent of matter survived the mutual destruction and went on to form the galaxies, stars and planets. But why should nature be so arbitrary as to choose one over the other? Why are we here at all? And, given that we are, why are we not made of antimatter instead? “People are confounded by this. The question of what happened to antimatter is one of the grand challenges of physics,” Fajans told a GlobalPost reporter on a visit to CERN, located just outside Geneva near Switzerland’s border with France. “It is astounding, and it’s also embarrassing, that no one knows why this is the case. Other than that, they should be the same, at least theoretically. If the ALPHA team’s investigations prove that they are actually different, antimatter will be in violation of one of physics’ most cherished laws, the charge, parity and time, or CPT, theorem. CPT basically says that processes in physics should turn out the same even when you flip the charges, turn everything inside out and run it backwards. Put another way, CPT gives the universe a nice, harmonious symmetry. If antimatter contradicts it, other theories may unravel. “As soon as you open a little crack, your imagination and ability to discover can run wild. Any difference will open up possibilities. Fajans, an animated 53-year-old MIT graduate and tenured professor at the University of California, Berkeley, spends about half of his time at CERN, the European Organization for Nuclear Research. His workplace is a massive warehouse in the middle of which sits a bewildering array of machinery. It is here that Fajans and the ALPHA team managed to trap 309 anti-hydrogen atoms for up to 1,000 seconds, or just over 16 minutes, an achievement they announced in June’s edition of Nature Physics. People have been creating antimatter for decades. Indeed it occurs naturally, albeit rarely. If you eat a banana, for instance, some of the potassium will emit positrons as it decays in your body. Sodium also emits positrons and, by combining these with antiprotons created in a CERN particle accelerator (and then slowed down in a proton decelerator), they can make anti-hydrogen atoms. Last year, the ALPHA team became the first scientists to trap anti-hydrogen, though only for a split second. Even this was a remarkable feat given antimatter is instantly annihilated when it touches anything, even air. “Basically we had to make a bottle with no sides,” Fajans explained, referring to the web of magnetic and electric beams that held the atoms in suspension in a perfect vacuum. By trapping anti-hydrogen for 16 minutes, the scientists are getting closer to being able to hold it in a state of calm and actually study it closely. One method is to look at the effects of gravity. There is a theory, albeit an unlikely one, that antimatter will “fall upwards.” But first the ALPHA collaboration will look at the spectral qualities of antimatter — that is, does it glow the same color as ordinary matter when blasted by microwaves or light? This might reveal differences in the basic structure of antimatter. Sadly none of this will provide an unlimited energy source of the kind that drives the Enterprise in Star Trek nor, happily, the kind that makes the bomb in Angels & Demons. The energy economics are unfeasible, Fajans explains. It takes far more energy to create antimatter than we can ever get out of it — a fact of physics that won’t change. On the bright side, positrons are already used in medical diagnostics, in positron emission tomography, known as PET scans. Antimatter might also prove useful in the treatment of cancer by annihilating tumors without damaging surrounding tissue. But most of the work is being done in the name of pure discovery. Fajans expects it will take another five to ten years before scientists have solid answers about antimatter, though he and his team plan to start experimenting on it this year. As it happens, he is cautious about the prospects of finding anything unusual. The current laws of physics are built on a very solid foundation and revolutions don’t come that often. But physics is by nature iconoclastic. Take the neighbouring Large Hadron Collider, the world’s biggest and most famous scientific experiment, which is hunting for the Higgs Boson, the so-called God Particle (a term physicists, not surprisingly, loathe.) Physicists need the Higgs Boson to exist in order to confirm their overarching theories. But it would be more interesting if it turned out not to exist, Fajans said.